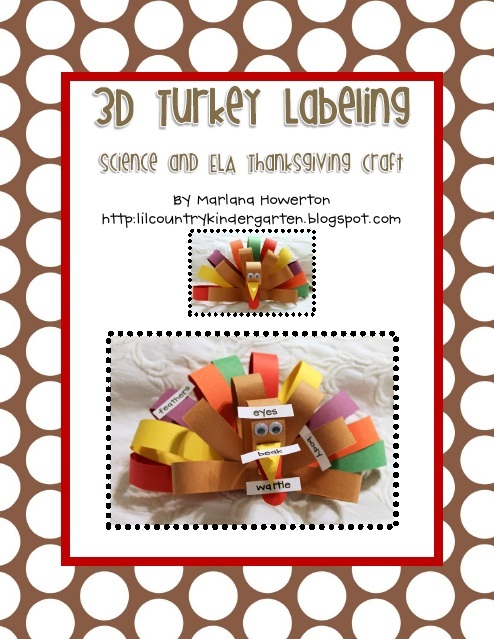 Lil Country Librarian: 3D Turkey Labeling Craftivity for Thanksgiving! 3D Turkey Labeling Craftivity for Thanksgiving! Do you need something fun to do this week before your Kinder kiddos take off for the Thanksgiving vacation? If so, I have a fun craftivity that will be super adorable in your classroom, as well as, create a learning opportunity for your students to extend their labeling skills to the parts of a turkey! Click on the picture below to see my 3D Turkey Labeling Thanksgiving Craft in my TpT store. It is only $1.50! I've stumbled across your blog before but found it again through TBTS. Cute blog!! Can't wait to explore it even more!